Any other football fans out there? We know there are! Sundays here are spent watching football…all day. We are Viking fans AND Packer fans (for those that don’t know-this is a very, very odd combo!) and enjoy football more than most anything. But, football isn’t the same without a cold beer and chicken wing in hand. I have three standard ways of making wings that I rotate each Sunday. Sometimes I’ll even make all three (they really are that fast!). 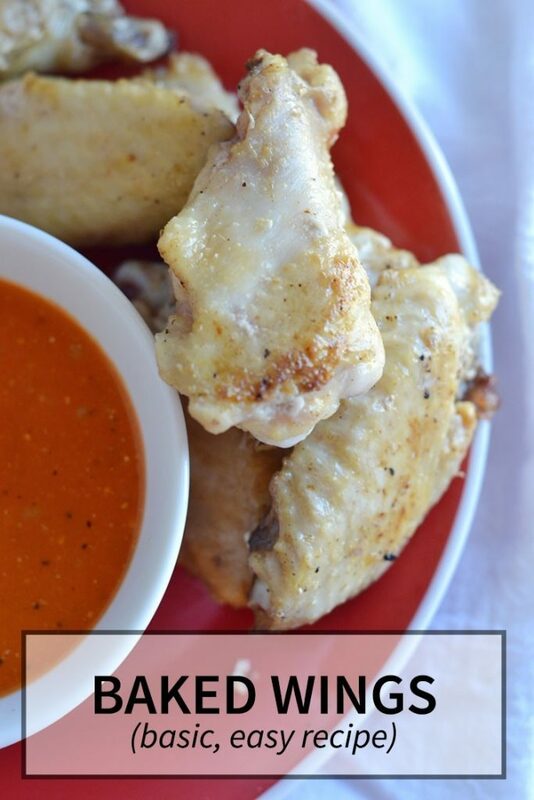 I make an easy baked chicken wings for when we have a great dipping sauce we want to try. 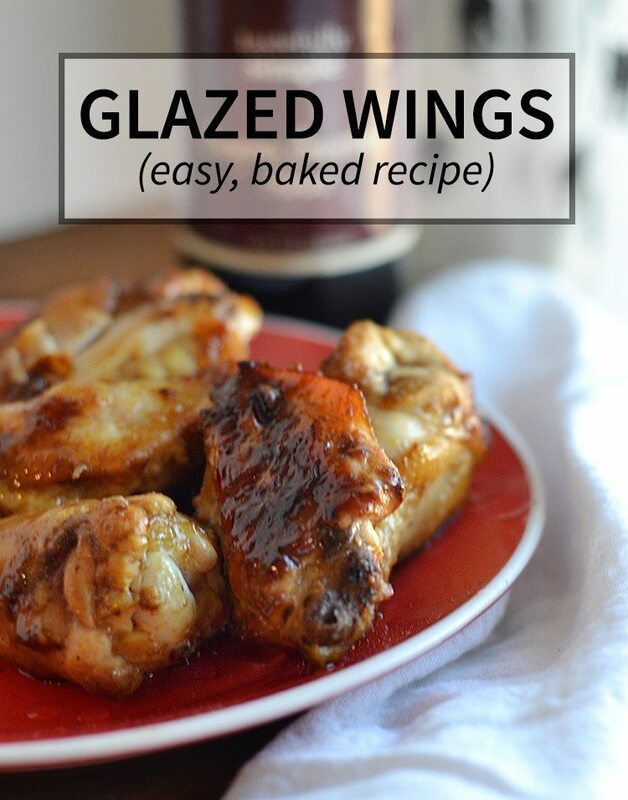 Glazed wings are the favorite when we have company and want to cut down on dishes. 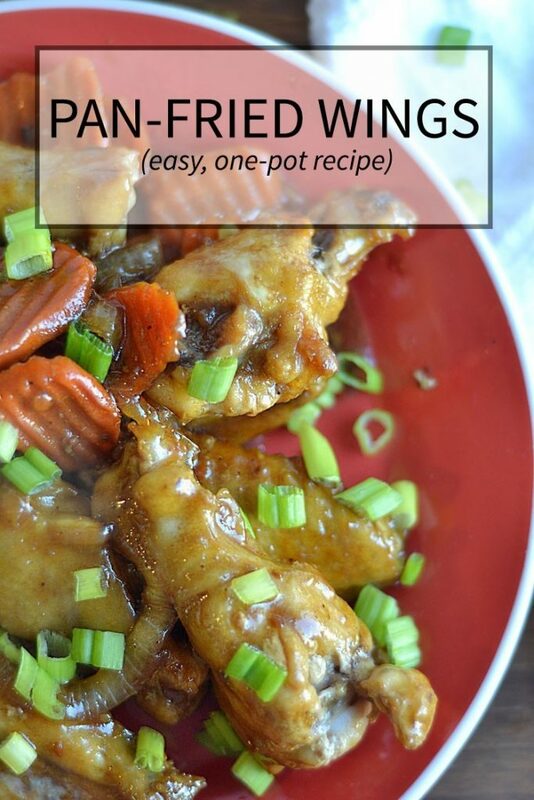 I pan-fry wings with veggies for when chicken wings are the meal rather than an appetizer. Today I’m going to give you all three of my basic recipes. These are very, very fast and easy to make! Gluten-Free Version: Wings are by definition gluten-free, it’s the sauces to be mindful of. Just read ingredients before purchasing and you will be fine. Or, make your own sauces! These easy Baked Chicken Wings are the most basic version you can do. Serve them up with a great sauce and you can’t go wrong! We love to have Tastefully Simple’s Parmesan-Garlic Sauce with this one! Levi says it’s kinda spicy and sweet…yummy! Mix the olive oil with salt and pepper. Toss the chicken wings with the oil mixture. Bake on a cookie sheet for 45-55 minutes (or until no longer pink) in a 400 degree oven. Pair with a great dipping sauce. Glazed wings are great for football games, parties, and appetizers because you can pack the flavor into the wings and eliminate sauces and dips. Choose a great glaze like Tastefully Simple’s Bayou Bourbon™ Glaze (a fave of ours!). Mix oil, salt, pepper, and glaze. Toss chicken wings with oil & glaze combo. Place glazed wings onto greased cookie sheet. Bake at 375 degrees for 45-50 minutes (or until no longer pink in center) in pre-heated oven. if wings won't take the glaze right away let them sit in the glaze and marinate for a few minutes, turning occasionally. Feel free to bake BOTH baked and glazed wings in the same pan...just use the 375 degrees instead of the 400 degrees that the baked asks for. The pan-fried wings are great for a full-meal idea. I usually make them with veggies and a sauce, requiring the use of a fork and knife to eat them. These wings are very fast to make and require little prep work. I love using Tastefully Simple’s Honey Teriyaki Sauce for these! Tastefully Simple’s Honey Teriyaki Sauce, onion, carrots, and a little green onion…tasty! On medium heat, heat oil in a saute pan. Add the sauce & veggies, turn down the heat to low, and cover. Cook covered for about 45 minutes, stirring often. Serve topped with chopped green onion. Be sure to use veggies chopped rather small so they have time to cook with the chicken. Add more sauce to yours, if you like. 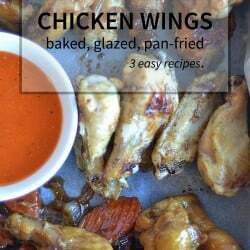 I hope you found a fast & easy recipe for chicken wings that you can use next Sunday for the football game! 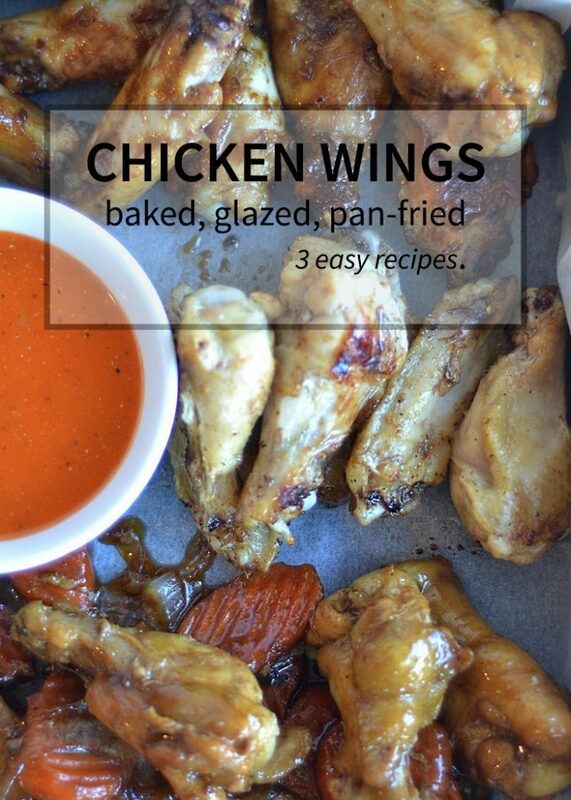 At the very least, you can make easy baked chicken wings. 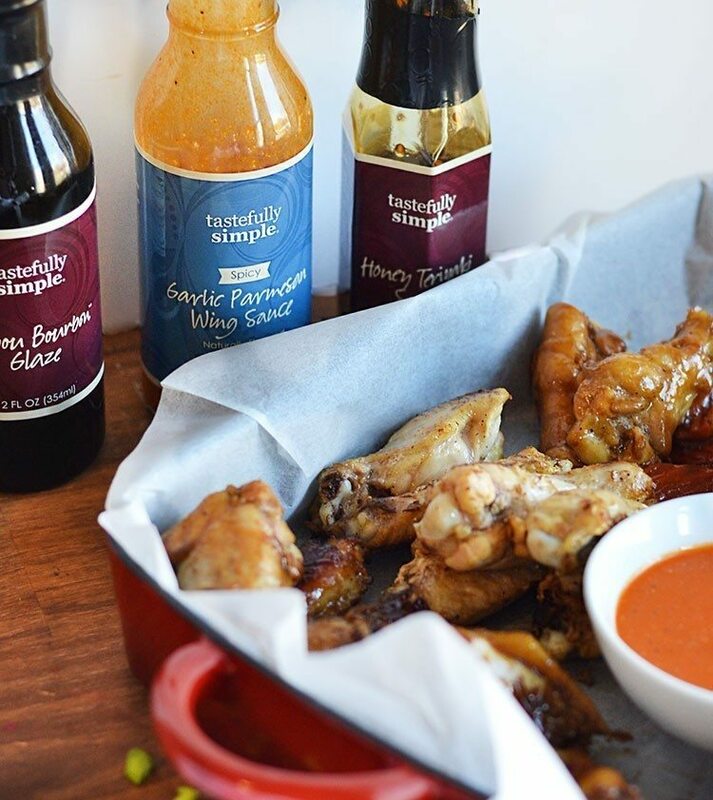 Remember to check out Tastefully Simple’s delicious sauces, dips, and glazes…they are perfectly delicious for wings! We are big ‘ol giant fans of this MN based company full of tasty, delicious, yumminess! As always, while we may have received compensation for this post, all opinions are our own. Find our full disclosure here.